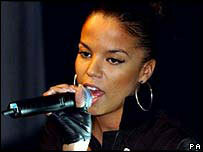 Singer Ms Dynamite has been charged with assaulting a police officer and disorderly conduct. The Mercury Prize-winning star, real name Niomi McLean-Daley, allegedly punched a female officer in the face, bruising her nose, while in custody. The singer, who was arrested after allegedly kicking the door to a London nightclub, is said to have been abusive towards officers who questioned her. She has been bailed to appear at Bow Street Magistrates' Court on Friday. The singer, who won the Mercury music prize in 2002, had been celebrating her 25th birthday before her arrest in the early hours of Friday morning. Police allegedly saw her kicking the front door to the Paragon Lounge nightclub in Hanover Street, west London. The star had been out celebrating her birthday with her brother Kingsley Daley. Mr Daley, 22, a company director, has been charged with obstruction of police. And Carlene Godwin, 24, was arrested and charged with a public order offence. The trio - all of whom are from Kentish Town, north-west London - were bailed to appear at Bow Street Magistrates' Court on Friday.